Don’t the days fly by? It seems like it was last Friday yesterday. I have had a mixed week, started off on a roll and by Wednesday things had deteriorated. Everything I touched I messed up, you know those days! I could not get my head around the colours, red and yellow for Summer of Color which was strange because I use both colours a lot. I was going to flag it because I was really struggling, when this morning I looked at my breakfast, The jar of vegemite and the margarine tub were red and yellow, my cup of tea was yellow and the plate was yellow. Well I am no Tracey Fletcher King, so I decided to photograph instead. Tracey if you ever get tired of painting cups and mugs, may I suggest you paint teapots! I was googling teapots for a picture I am doing and found some marvelous teapots. Here is one I think fits in with my theme. Yeah I know it is Marmite, but I thought it cute. 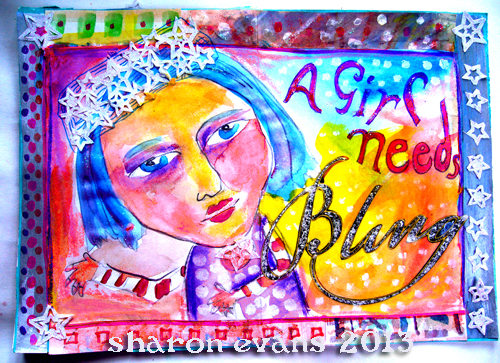 This is the center spread for my giveaway journal. All girls need some bling in their lives. Some like my friend Shelly like a lot of bling, her home is festooned with crystals, sparkly lights and glittery stuff. You can’t walk past a store with bling in without her darting in and looking. Makes it easy to get presents! You can’t see but there is a lot of glitter glue making an appearance and the tiara is pure glitter. So this is a tribute to those who need bling a lot! I have just realized that as I was writing this that all of these are full of red and yellow! Der! Last week’s winners of the postcard give away were Giggles and Stefanie Stark. If you want a chance to win some postcards this week, leave a comment. The winner chooses from the postcards on my postcard page (tab at top). If you want to see more quirky whimsy, my post on Tuesday screams it. That owl poatcard is gorgeous! My what a great teapot!!! I want one!! Wonderful sketches and photos Sharon! 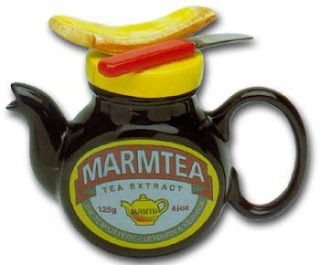 We eat marmite in the uk but I prefer vegemite;) Fun and quirky teapot which I am sure Tracey would love! 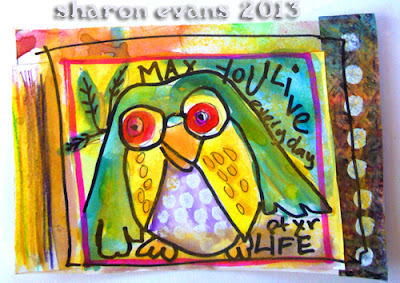 I just love your colorful postcards with all their reds and yellows, especially that cute bird filled with life. 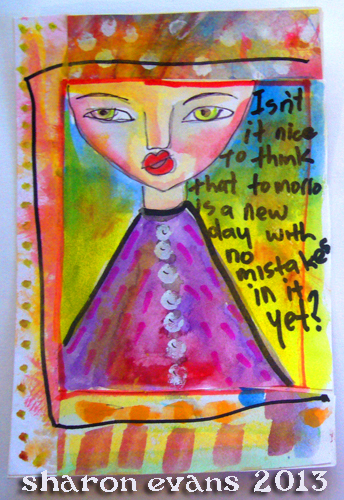 I would LOVE to add one of your postcards to my artist friends art collection. Blessings! What gorgeous colors in your postcard art, Sharon. I know I've heard of Vegemite, but I have no idea what it is. Your blog is a beautiful splash of color this week. Love it! 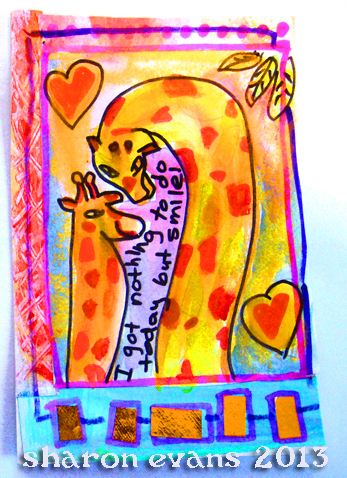 oh what happy and vibrant art-I love it all!! made me chuckle about the Tracey/ photos for SOC-I feel the same way you do. At this time I wouldn't even attempt to sketch :)Happy PPF! Even your giveaway journal has enough dominant yellow and red to be soc....seems like many of us were the same about those colors...I do love them...but having to do those colors this week didn't appeal...so odd!! Love all your cards, your photos, journal page and fun teapot!! Good job!! So glad I won the postcards!! 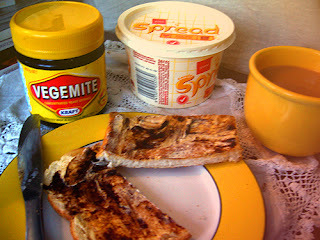 What fun are these goodies in red and yellow- a totally cool post....I must try the Vegemite someday! Great cards and your teapot pic made me smile! Happy PPF! Lovely work, your postcards are just so cute. And anything with glitter is gold! Love your journal page with the bling! We girls do love it. Also enjoyed your fun post cards! Well, yes, for someone who was struggling with the SOC-colours this week, you do have a lot of reds and yellows in those postcards. They are all perfect SOC-pieces. Love all the colours in your center spread. I love your colorful world. I think birds must be in the universal thought wave right now, as I too have been thinking of them. Will we all be taking flight? Thank you for your comment on my blog. Love all the colorful pieces. Such playful characters appear on them. Happy PPF and SOC, have a great weekend. I love your works of art - each one is so beautiful! and I really like your photos for this week's SOC colors! So fun and creative!!!!! Yeah, Tracey would love painting these!!. You took a great composition of the breakfast :). 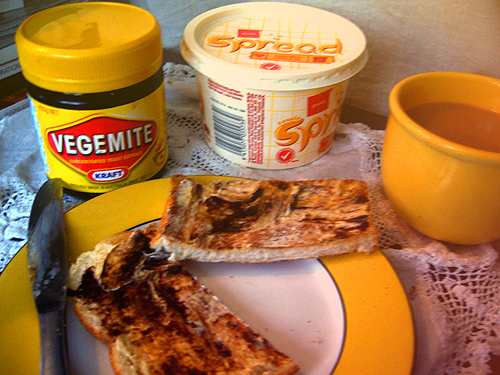 I've never tried Vegemite, never been to Australia but I heard stories about it :). Will try once I get there! LOVE the postcards, and yes ... I love to think that tomorrow is still pure, and hopefully to fill it with all the good intentions :). Love how you used the color this week, your pieces are so bright and cheerful! HPPF and SOC! Love your vibrant use of color! Beautiful! I definitely feel your friend Shelly on the bling--I love things that sparkle, light up, glitter, glow, and shine... Great spread!